Himachal – How to Reach Planning to Visit Himachal ? Find the various ways to travel to Himachal by Road, Cars, Trains, Indian Railways, Flights, Airlines and Airports in Himachal. 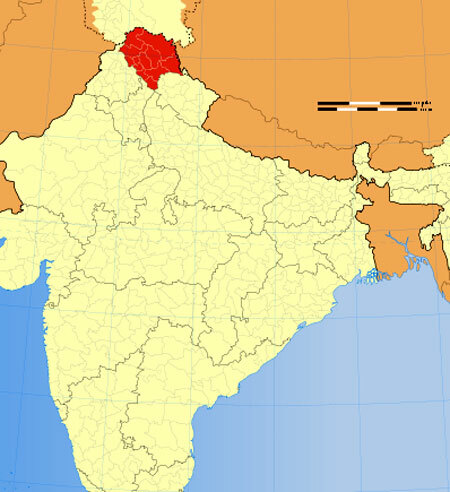 Himachal Pradesh is located in Northern India and is bordered by Jammu and Kashmir on the north, Punjab on the west and south-west, Haryana and Uttar Pradesh on the south, Uttarakhand on the south-east and by the Tibet Autonomous Region on the east. By Air (flights): There are 3 domestic airports in Himachal – Shimla Airport, Bhuntar Airport serving Kullu and Manali, and Gaggal Airport serving Kangra and Dharamsala. The air routes connect the state with Delhi and Chandigarh. There are no international airports in Himachal Pradesh. Air India, Kingfisher Airlines, Jagson Airlines has flights from Delhi and Chandigarh to Kullu and Shimla. By Trains (Indian Railways): There are few Railway stations in Himachal. The Pathankot–Jogindernagar line connects Punjab with Himachal Pradesh. The other railway tracks pass through Shimla, Solan and Una. Shimla is connected with Kalka by a narrow gauge railway line, which in turn is connected with the major cities in India. Himachal has two narrow gauge rail tracks. The Kalka-Shimla Railway track has a length of 96 kilometres. It passes through 102 tunnels and crosses 864 bridges. By Road: Roads are the major mode of transport in Himachal Pradesh with 8 national highways (NH) and 19 state highways. Some roads get closed during winter and monsoon seasons due to snowfall and landslides. Regular bus services connect Shimla with Chandigarh, Kullu, Manali, Delhi, Mandi, Pathankot, Ambala, Chail and Dehradun. Local taxis are the major local transport here. District Hamirpur has got the highest road density in the country. HPTDC operates daily Volvo/Luxury coach service from New Delhi to Manali, New Delhi to Shimla and New Delhi to Dharamsala and vice versa. HPTDC also operates coaches on the famous Manali – Leh route from July to September. NH 1A touches Shahpur. NH 20 passes through Pathankot, Chakki, Nurpur, Palampur and Mandi. NH 21 connects Chandigarh with Manali through Mandi. NH 22 connects Ambala with Kaurik through Kalka, Simla and Wangtoo. NH 70 passes through Mubarakpur, Amb, Nadaun and Hamirpur. NH 21A begins at Pinjore in Haryana, passes through Nalagarh and reaches Swarghat, where it connects with NH 21. NH 88 connects Shimla with Kangra through Hamirpur and Nadaun. NH 72 begins at Ambala and passes through Amb and Paunta Sahib in Himachal before terminating at Haridwar in Uttarakhand. Note: All the maps, images in Himachal How to reach belong to their respective owners. We have used images for information purpose only. If the map owner wants us to remove the maps then do write to us. Information on Flights, Indian Railways, Roadways to Himachal may differ from actual. You are requested to check Indian Railways, Airlines and related tourism department of Himachal for latest updates.